*If you prefer, you can see a .pdf version here (2.37 Mb). Once again, greetings from Ikoma! As we gear up for a full and busy summer, let us take a moment to update you on the various aspects of our life and ministry in Japan. The first half of 2009 has been a season of ups and downs for SIBC. On the positive side, the preaching series on 1 John that we started back in January has been a huge blessing. Through the wonderful writings of the Apostle John, God has been dismantling some of our religious ways of thinking in lieu of a more relational understanding of the Christian life. According to John, the Christian life is really about walking in a friendship of love; both with God and with one another. The challenge we now face is learning how to actually live this way each and every day. We are finding the old adage to be true, “old habits die hard” (especially religious ones!) However, as we take this journey together, we hope to discover authentic relationship with Jesus and genuine friendships within our church family. Even after we finish up our series in May, please pray that the lessons we have learned would not soon be forgotten. Another “up” has been the newest addition to the church leadership team, Hiro Kanayama. As a relative new-comer to SIBC and the youngest member of the team, Hiro offers a fresh perspective on the ministry and mission of the church. We are excited to have Hiro on board, and know that he and his family are going to be a great asset to the church. 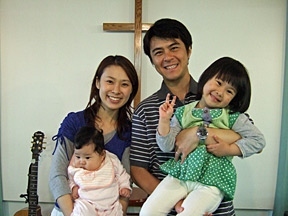 Please pray for Hiro, his wife Takako, and their two girls. This spring, Chris had a chance to speak during the morning worship service and received some encouraging feedback from the church family. Although she dedicates much of her time to teaching in the Sunday School, she also has a desire to minister to the adults. Please pray for more opportunities for her to serve in this way. On the down side, the church has recently said goodbye to a number of our dear friends. 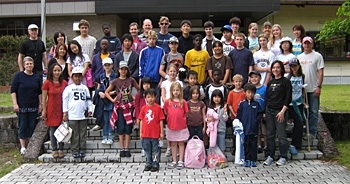 The nature of international ministry is that people are always coming and going, but so far 2009 has seen more than it share of “goings.” Whether it was people returning to their home countries or just relocating to a different part of Japan, about one quarter of the adults in the church have left. Obviously, it is hard to see so many friends leave at once. Their friendships are deeply missed, and their absence is deeply felt on Sunday mornings. However, through it all, we are not discouraged. We know that Jesus is the Head of SIBC, and whatever it is that He is doing right now it is a part of His commitment to build up His church in Sakai (Matt 16:18). Please pray for SIBC as we go through this time of transition. More than ever, may we keep our eyes on the Shepherd. In June, Michael will finish up his first year of serving as school chaplain at KCS. The monthly messages have been a lot of fun for him, and there has been some wonderful feedback from both students and staff. Praise God! He has already agreed to do it again next year, as he desires to continue teaching the students about walking in friendship with Jesus. Please pray for Michael over the summer as he looks ahead to the new school year. May the Lord give him fresh ideas for leading the students into authentic Christian living. In mid May, Michael also had the opportunity to speak at the KCS all-school campout. The highlight of the two-day camp was the last morning when we had a time of open sharing. Not knowing if any of the students would even dare to share, we were excited to see almost half of the kids give testimony of what God has been doing in their lives. It was clear to us that God is at work at KCS and He is bringing about much fruit in the lives of these dear young people! Please pray for KCS. May the Lord bless the school as it strives to foster both academic and spiritual growth in the lives of the students. We also want to ask for your prayers about the new KCS school facility. A few years ago the building that KCS had been renting needed to be torn down due to a termite problem. This began a 3-year search process that resulted in KCS buying a piece of land this spring. The Lord miraculously provided the necessary funds to purchase the land, and the school is now in the process of raising additional funds to renovate the property so that it can be used as a school. About $200,000 is still needed in order to turn three existing buildings into classrooms and an empty field into a playground. Please pray for the Lord to provide the necessary funding. KCS hopes to start using their new building in the Fall. Finally, we have a couple of prayer requests for family members in the States. First of all, please remember Chris’ father. 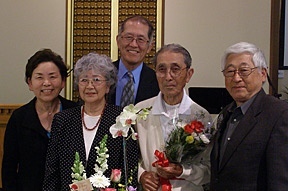 On March 29, at the age of 86, he was baptized at Gardena Valley Baptist Church! Obviously we are very excited about his new life in Christ. Please pray for him as he begins his journey of walking with Jesus. Also, please pray for Michael’s mother. Some time this summer (possibly in early June), she will have a bone marrow transplant. The procedure itself is pretty straight forward, but it will take about 4 months for her to fully get back on her feet. Please pray for strength and a speedy recovery. Thank you. On a personal side, we are all well. Michael has been taking advantage of the nice spring weather to do some hiking near our home, and Chris is enjoying keeping in touch with folks through Facebook. Luke will turn 9 in a few weeks and then finish up 2nd grade in mid-June. He is also taking piano lessons and really enjoys reading. Well, that’s about all for now. Hope that you are all doing well. Thanks again for your prayers and support.